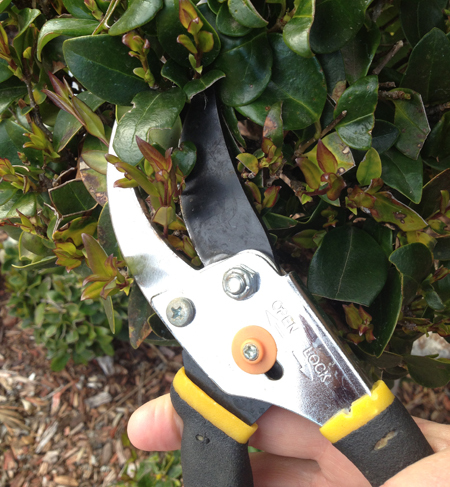 Between now and mid February Texas gardeners should begin winter pruning. Neal Sperry offers this list of plants that should be pruned during this time of year. Shade trees: remove damaged or dead branches (pruning sealant only on oak cuts). All cuts should be flush with the branch collar on the trunk. Evergreen shrubs: prune to maintain natural growth form of your evergreen shrubs. Peach and plum trees: prune to remove vertical growth and keep plants low and from spreading. Grapes: for those that grow grapes, remove as much as 80 to 85 percent of cane growth. Summer-flowering shrubs and vines: prune damaged or excessive branches. Do not top your crape myrtle plants. Prune dead stems and leaves from perennials to tidy up your garden beds. Spend the time now to prune and care for your trees and plants, it will pay off in the spring. Looking for garden supplies? Come visit our store! This entry was posted on Monday, December 15th, 2014 at 3:18 pm	and is filed under News & Updates. You can follow any responses to this entry through the RSS 2.0 feed. Both comments and pings are currently closed.